This book features effective artistic practices to improve literacy and language skills for emergent bilinguals in PreK-12 schools. Including insights from key voices from the field, this book highlights how artistic practices can increase proficiency in emergent language learners and students with limited access to academic English. Challenging current prescriptions for teaching English to language learners, the arts-integrated framework in this book is grounded in a sense of student and teacher agency and offers key pedagogical tools to build upon students’ sociocultural knowledge and improve language competence and confidence. 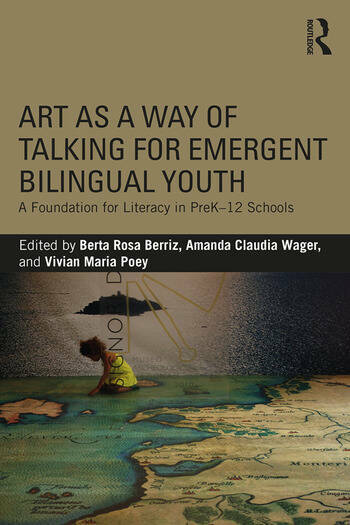 Offering rich and diverse examples of using the arts as a way of talking, this volume invites teacher educators, teachers, artists, and researchers to reconsider how to fully engage students in their own learning and best use the resources within their own multilingual educational settings and communities. 2. Heritage Languages as a Valuable Asset for Multilingual Children in US Schools and Beyond: We Can’t Afford to Lose Them! Berta Rosa Berriz is an Instructor of Creative Arts and Learning at the Graduate School of Education at Lesley University, USA. Amanda Claudia Wager is an Assistant Professor of Bilingual/TESOL Education at the Graduate School of Education at Lesley University, USA. Vivian Maria Poey is an Associate Professor and Director of the M.Ed. in Art, Community and Education program at the Graduate School of Education at Lesley University, USA.